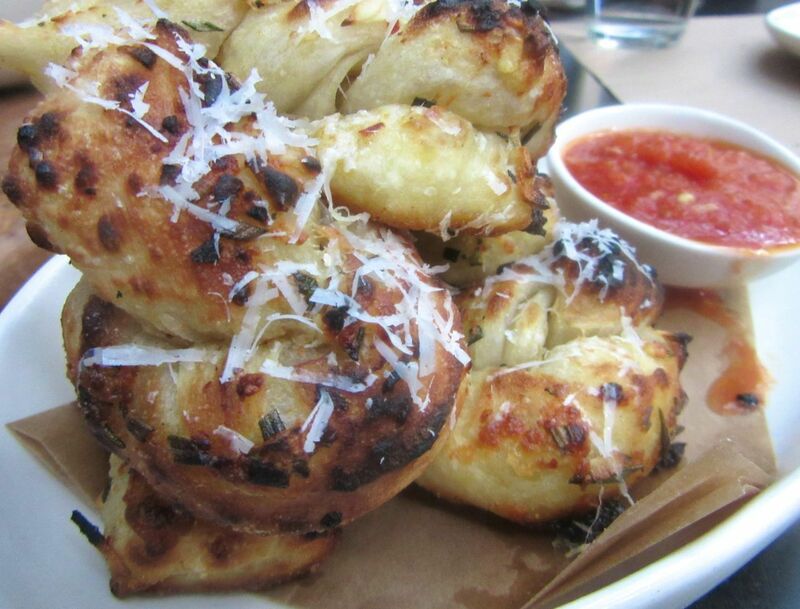 Fabulous garlic knots, twisted and baked to order, replace popovers at Tourondel’s new L’Amico. 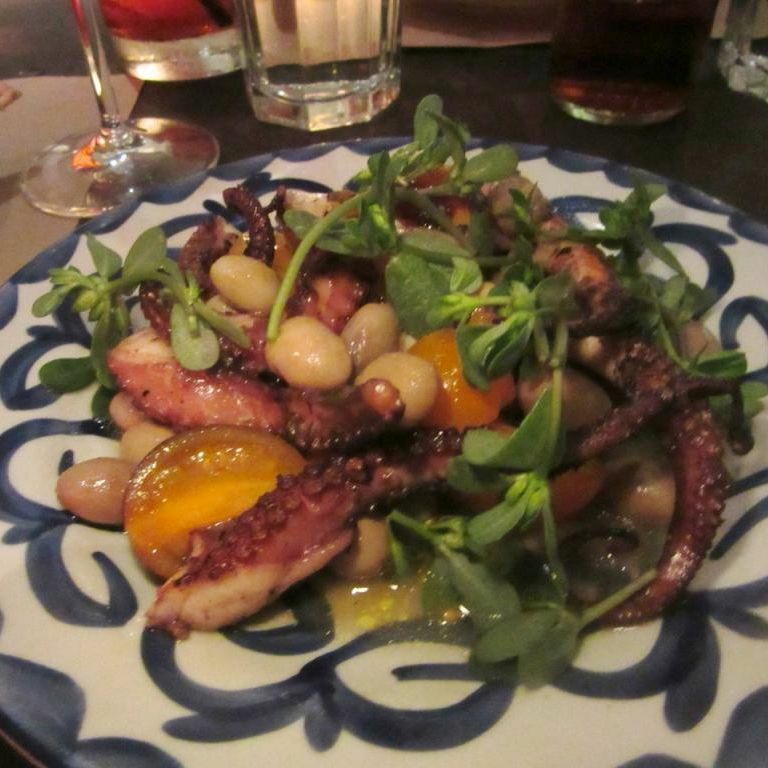 We’d just finished dinner at George Mendes’ lively Lupulo and were walking west on 29th Street toward our parked car, when my friend was stopped in her tracks by the unlikely sight of a lush, courtyard garden and a row of tables fronting a dining room. What could it be? Till L’Amico opens in fall, there is great Tourondel cooking at The Vine with seating indoors and out. 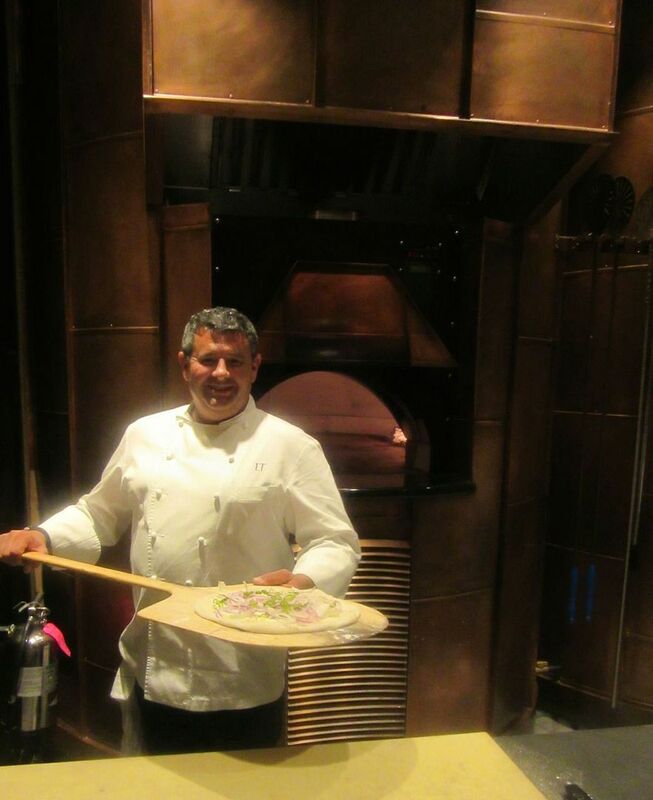 The chef and his crew work out of L’Amico’s kitchen cooking food for The Vine in two copper ovens. Was this a twilight zone? How could Laurent Turondel open a restaurant without our knowing? That’s Laurent Tourondel, the lovable hard-luck chef foodies like us have followed since the ‘90s, when he won us with his three-star mastery at Cello in a townhouse on East 77th Street. And later, when we followed him to discover the lure of a giant popover and his irresistibly lush gnocchi at BLT Steak. Our first night at Vine, the chef posed near Kyle DeWoody-curated collections. Tourondel had pretty much walked off the edge of the world after triggering a frenzy at The Arlington Club and then breaking camp. But yes, he had told me he was planning an Italian place at the Eventi Hotel. “With pizza,” he had promised. 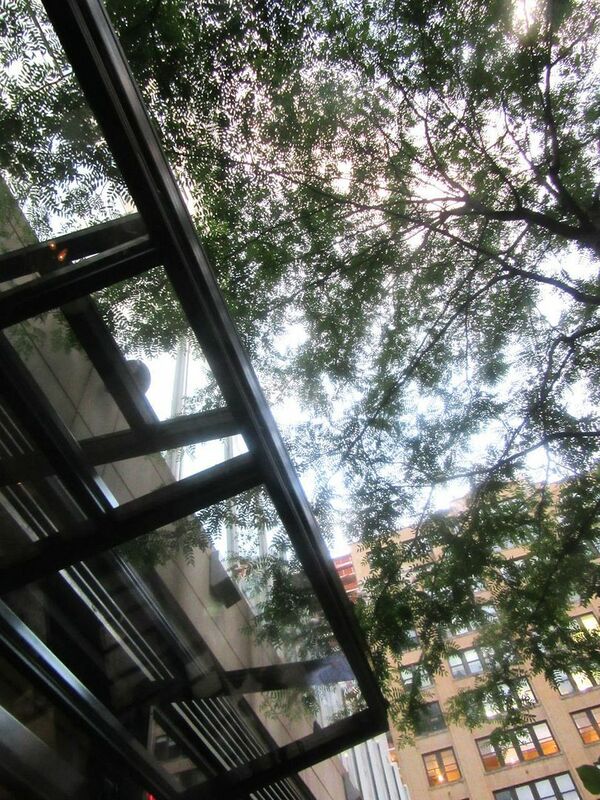 A table in the courtyard garden gives you trees above and a view of the interior action. “We’ll be back tomorrow for dinner,” my friend told the waiter. I could not change my dinner plans for Saturday. But encouraged by her report -- fabulous -- friends and I are sipping $14 cocktails at our own four-top on the flowery terrace the Monday after. I realize this has to be the same backyard that once held the spillover from Jeffrey Chodorow’s food court in the Eventi Hotel where Red Farm was born. One evening the four of us shared halves of all four crostini. 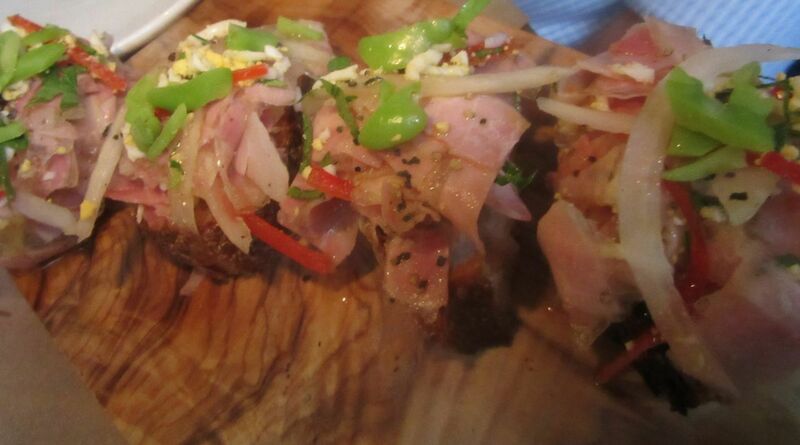 Testa (head cheese) was my favorite. It’s true, we’ve landed on one of those rare New York summer nights, like spring, actually -- not too hot, not too cool, not at all humid. And after a couple of cocktails and the speck and caraway pizza we put away while debating what to order, we are eager to be pleased. But most of what we are tasting is indeed pleasing or better. 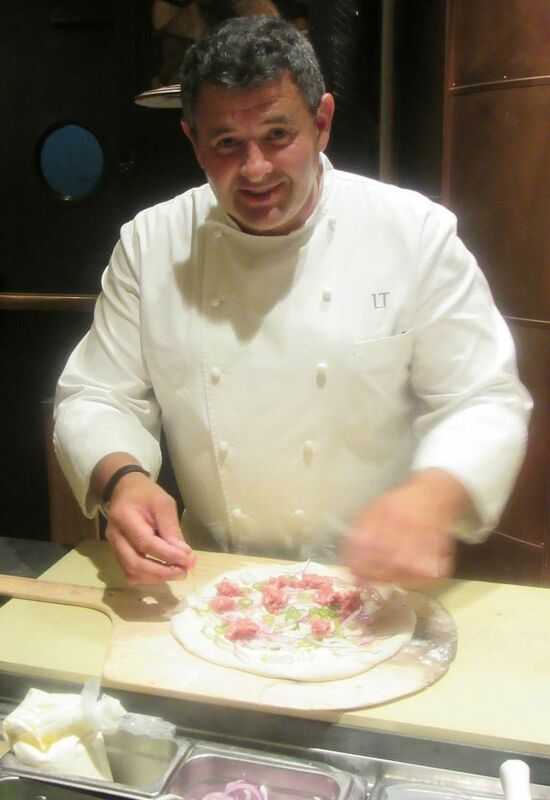 Laurent is French so that gives him time and license to rethink the culture of pizza. That dinner-plate size pizza, for instance. 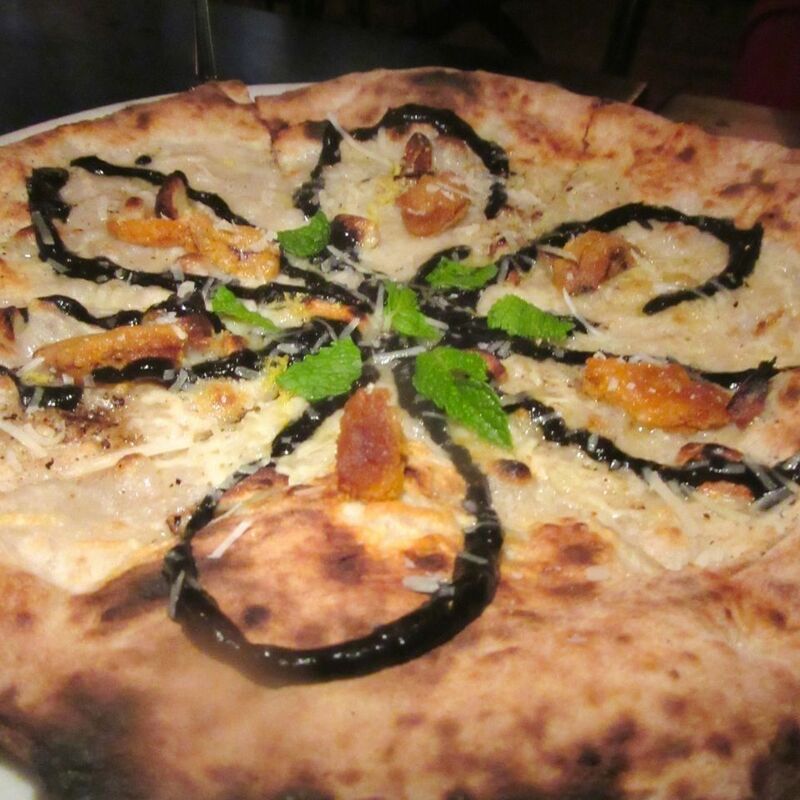 It’s unexpectedly crisp and flavorful beyond the obvious scorch of black blisters from the oven, nothing like a classic Neapolitan pie with its soft and rubbery border. 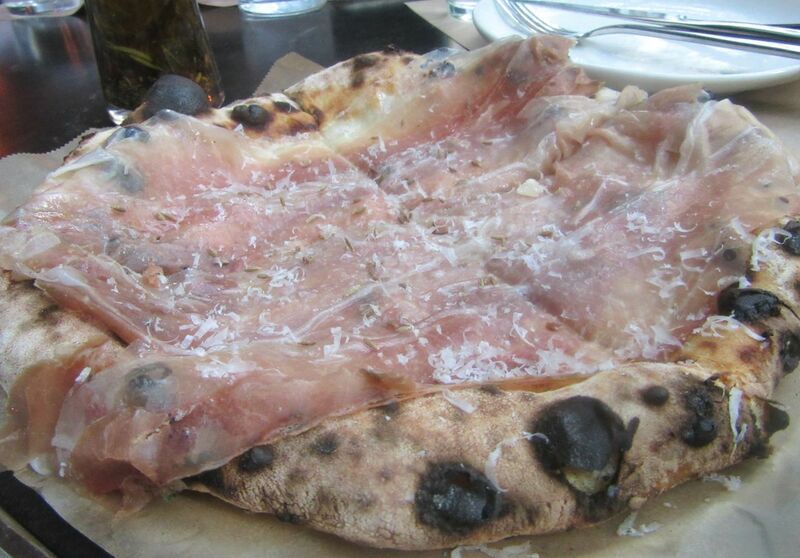 The topping is unusual too, and elegant with sheer slices of cured speck layered on a melt of mozzarella and two Italian cheeses you don’t usually see on a pie, robiola and taleggio. I find myself even eating the char. I wanted to taste a second pie. 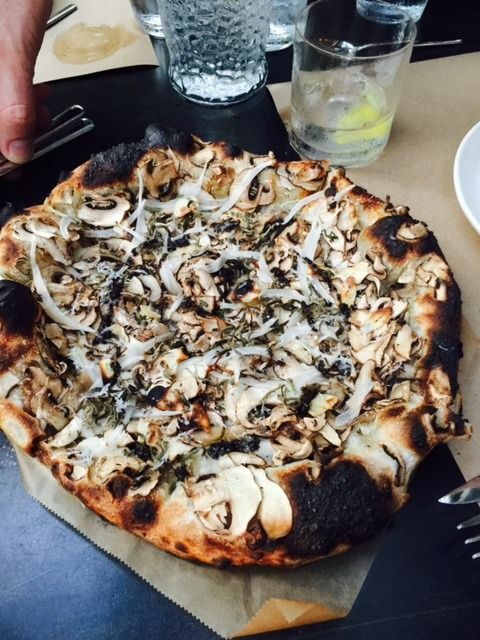 Here white mushroom sits on truffle paste with fontina and taleggio. The little dish of garlic knots might seem redundant, as I order a second pizza -- white mushrooms with truffle paste on fontina and taleggio. I’m trying to please everyone -- dieting pals, but first of all, myself. 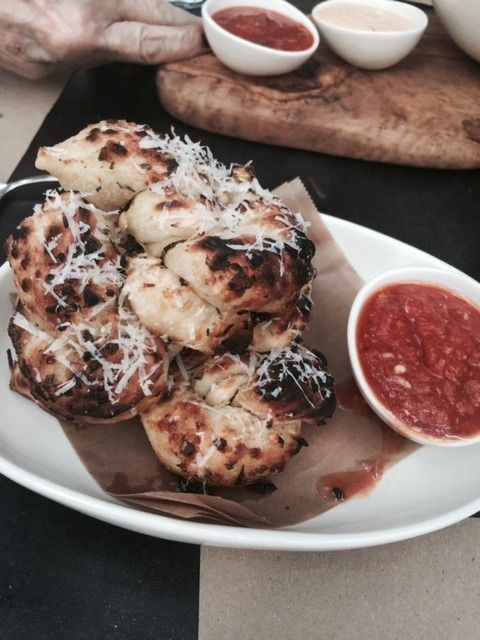 I’ve had garlic knots before, but nothing quite so tasty, scarcely needing a boost from the adjacent tomato sauce with a dusting of freshly grated pecorino. 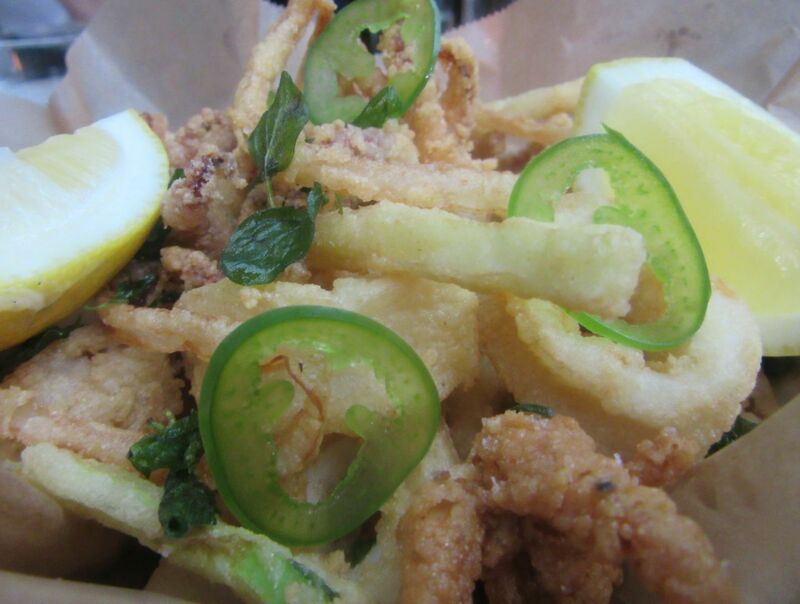 A bowl of calamari fritti -- good to share, -- with Calabrian chile pepper aioli. I could easily put away a second. I reach and hesitate and take some crusty tentacles instead from the bowl of expertly-fried calamari. I might feel obliged to finish that too, with or without a dip into the feisty Calabrian chile-spiked aioli. Spiced tuna crudo with lemon yogurt and charred broccoli sprouts. The arrival of spiced rare tuna chunks with lemon yogurt and charred broccoli splashed with buttermilk aioli gives the abstemious something to chew on, and me another way to enjoy tuna “crudo.” The mushroom pie is pre-cut in four large quadrants -- I wish it had been cut in eighths, but I finish my fourth, relishing the crust, while my carb-wary companions fastidiously saw off slivers to taste, leaving the rest without obvious regret. 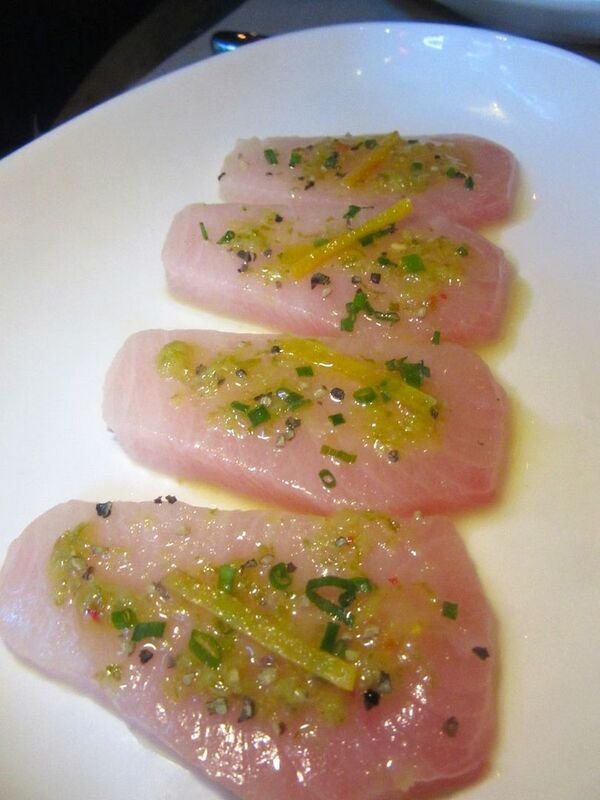 Grated lime zest and orange confit add a citric hit to cool petals of raw yellowtail. You don’t have to stay away from Laurent Tourondel’s Garden of Temptation if you’re dieting or “being careful.” The menu is a small, gray rectangle, but enticing options are packed in. Thick slices of yellowtail crudo – firm and cool -- with a rubble of lime zest and orange appeal to virtue, though a bit too citric. The $16 serving of spiced tuna with charred broccoli sprouts could be dinner, if no one else is sharing. Charred broccoli with its buttermilk aioli on the side, from the five options clustered under the title “Verdura,” is a must for all of us. One evening’s special fontina filled agnolotti are tossed with lobster and crab. Those options include the wheatberry and quinoa toss with favas and peas that I never got around to ordering, though I meant to, and a kale salad with trevisano and escarole that I ignore because it’s all about the dreaded kale I’ve sworn off forever. Careful weight-watchers might know to avoid the smoked ricotta gnudi with baby heirloom tomato, which is more pastaesque than “Verdura.” I find the big, round, elastic gnudi orbs my least favorite thing. Wood oven-roasted chicken emerges crusty and juicy to be served with broil rabe on dribbles of lemon. As “Secondi” arrive, my companions bask in their comfort zone of virtue with the the skirt steak and very lemony a crusty chicken, crispy and browned from its wood oven roast. 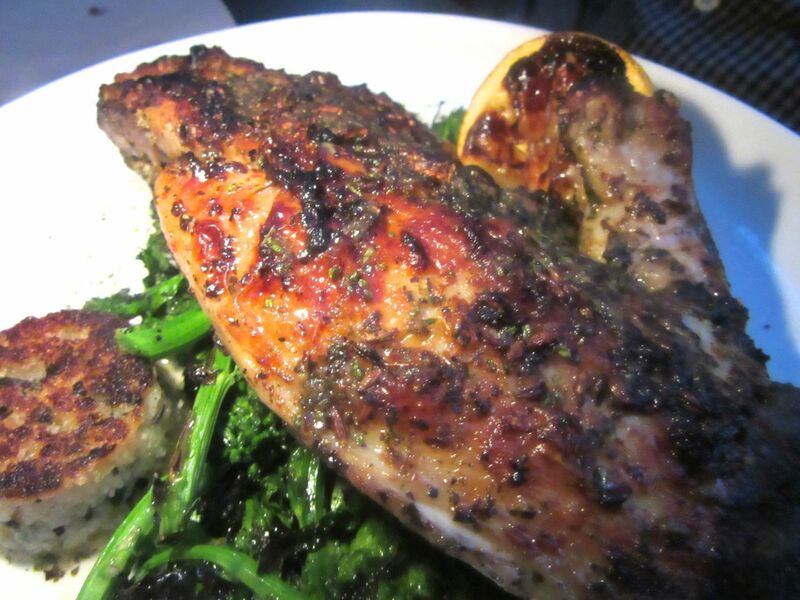 The bird comes with a tangle of spicy and salty broccoli rabe and a small tuffet of lemon confit. 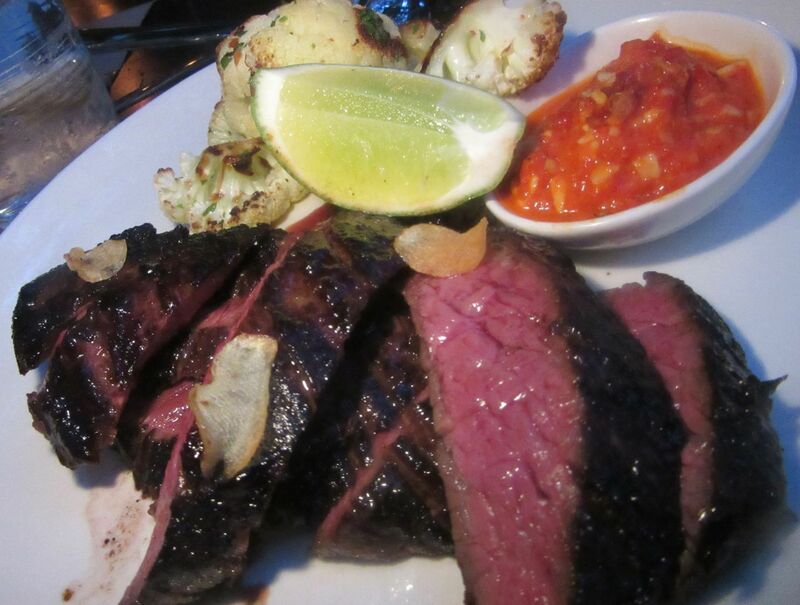 As expected, the chef who created BLT Steak delivers a superior skirt steak. As the chef’s fans at BLT Steak and The Arlington may suppose, his skirt steak is a gem, detonated with more of that Calabrian fire and almonds, too. They generously share tastes and sweep up some lobster from our agnolotti bowl. 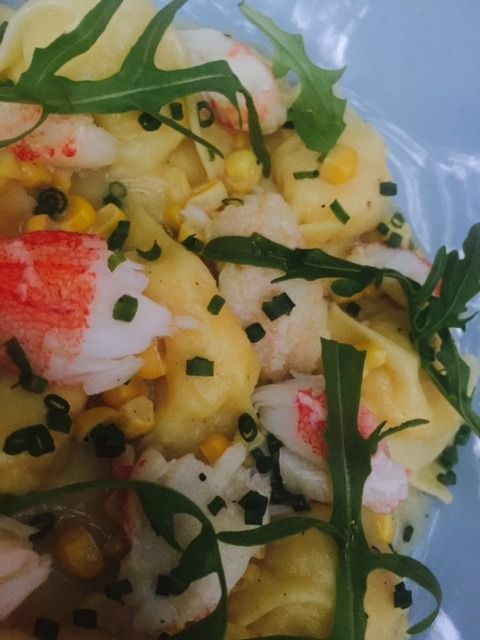 The little packages, the special of the evening, explode with melted fontina and are tossed with crab as well as lobster, scallion and kernels of fresh corn. The greenery on top is spicy rocket Laurent picks up at the Greenmarket. 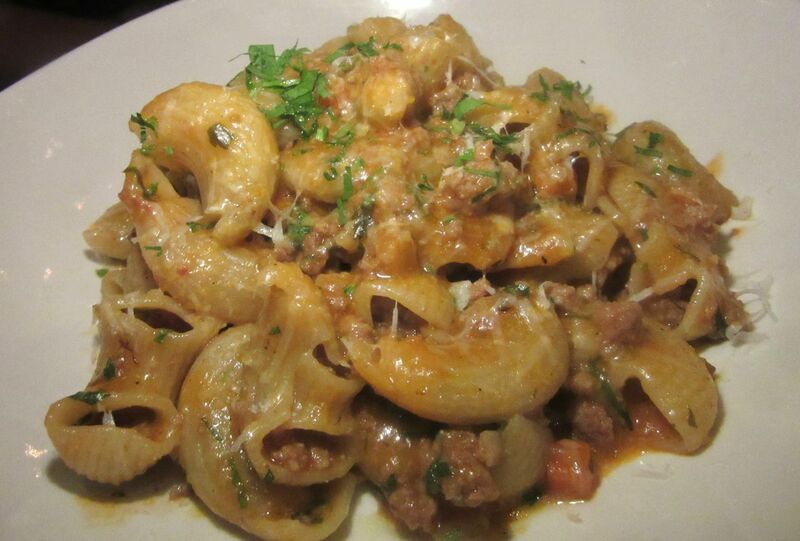 Pipe rigate curls are tossed with a pork and veal shoulder Bolognese and shaved pecorino. 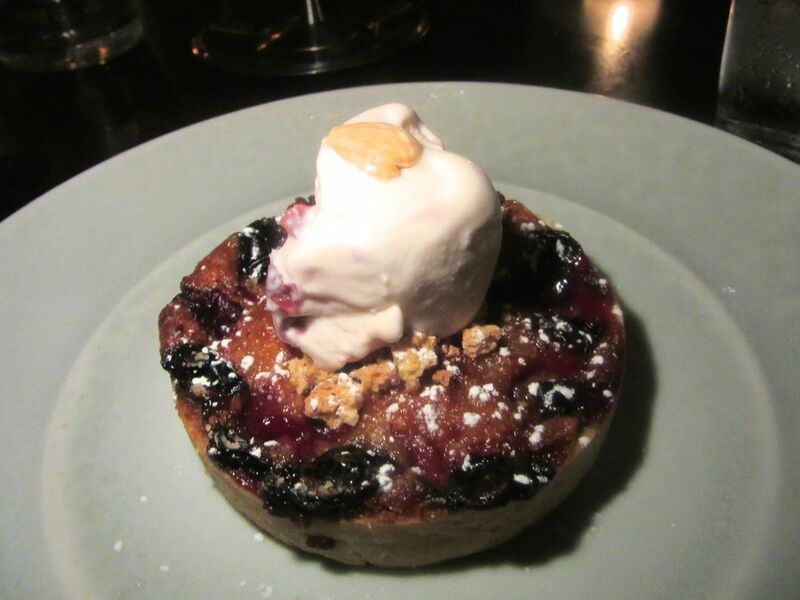 That’s where he found the sour cherries in tonight’s tartlet -- paired with white chocolate, the tart and the sweet. A rare treat for this sour cherry lover. 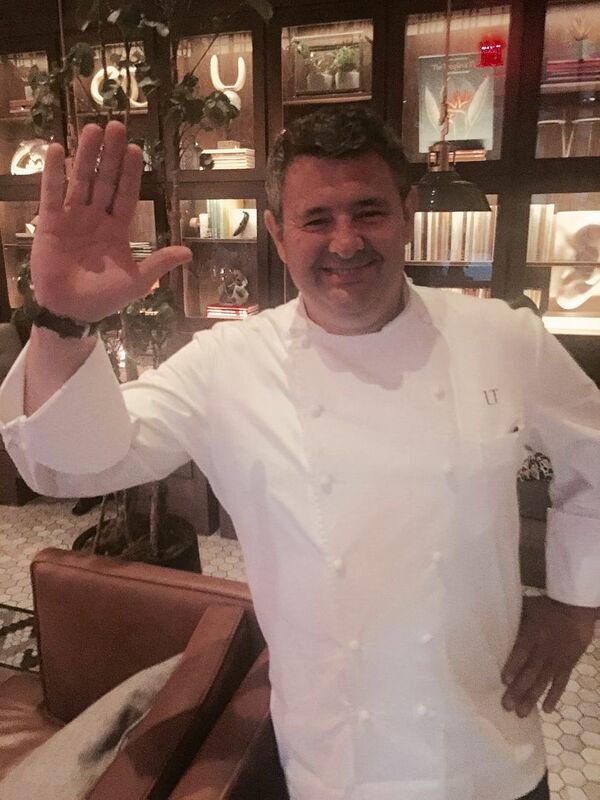 The chef comes by in his whites to say hello. 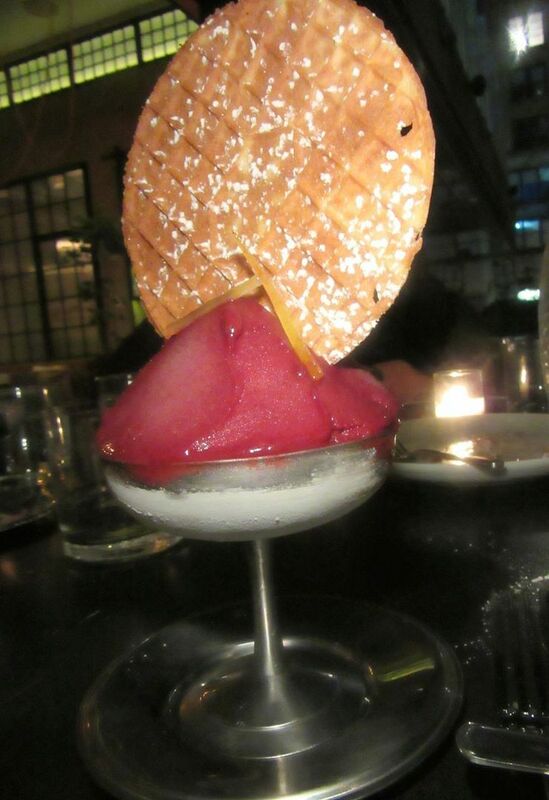 The strawberry ice cream, intensely fruity, even in texture, comes with a pizzelle, the pastry disc baked to order. I am reminded of a Ziegfeld Follies chorus line. Just the luck of this sour cherry fan to find sour terry tartlet with white chocolate as a special. On another evening we order warm chocolate torta with black cherry amaretto ice cream that my friend Ryan rejects for too much amaretto and not enough black cherry. We are eating inside to avoid threatening thunderstorms and a determined mugginess. That’s a chance to notice the pounded metal tabletop, the comfortable chairs, the library in the distance, and the comic touches curated by Kyle DeWoody: a plant in a smiling pot, a large white ear, the cast of a nose, and a work of twisted rope over our heads. A facsimile of a library card comes with the bill. The ice cream service in footed silver dishes with pastry headdress remind me of the Ziegfeld Follies. At the next table. three women work on their computers, the house WiFi giving Starbucks a challenge. Afterwards. we are led through the Eventi lobby and the back kitchen to the chef’s lair. A fully furnished restaurant fronts the open kitchen with two custom-made copper ovens where he stands with a team dispatching orders to The Vine. 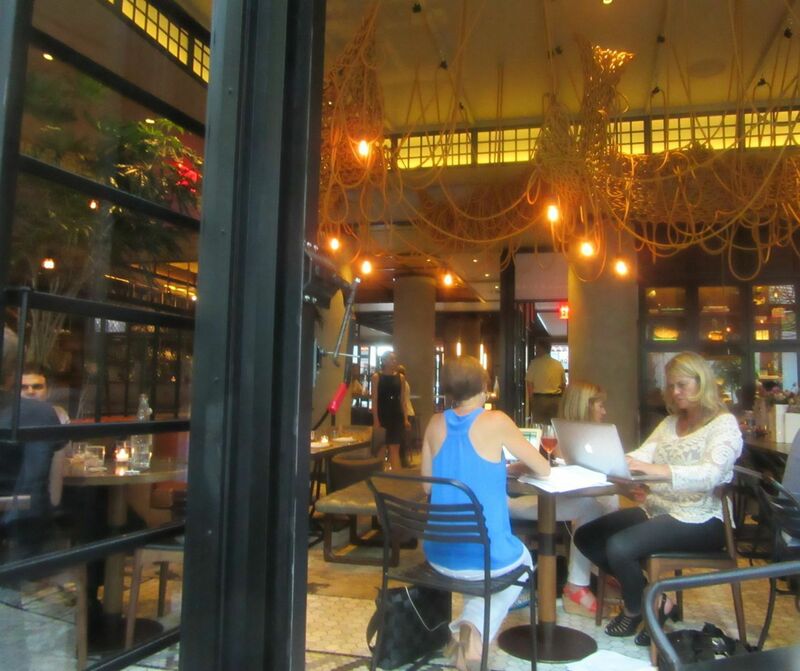 Tourondel expects to service both L’Amico and The Vine from this open kitchen when fall arrives. 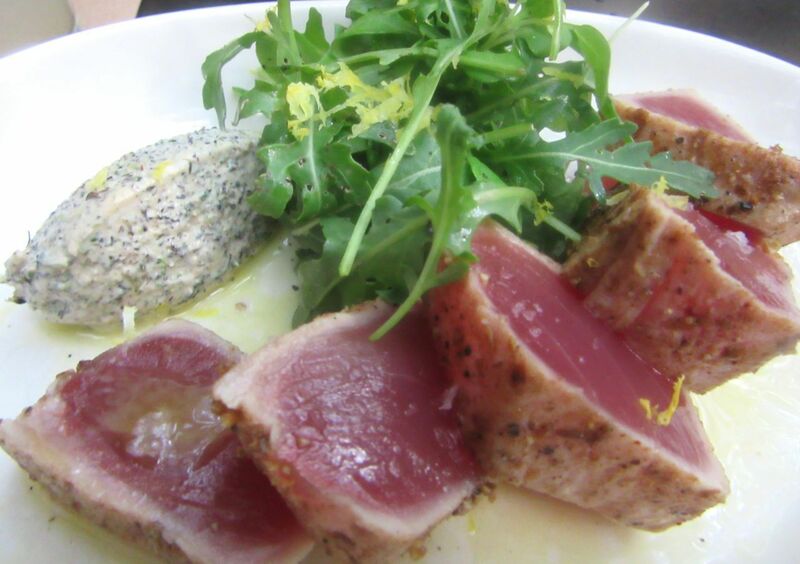 This is L’Amico, the restaurant Tourondel has promised. It’s ready to open, hidden from passersby on the street by heavy velvet drapes. 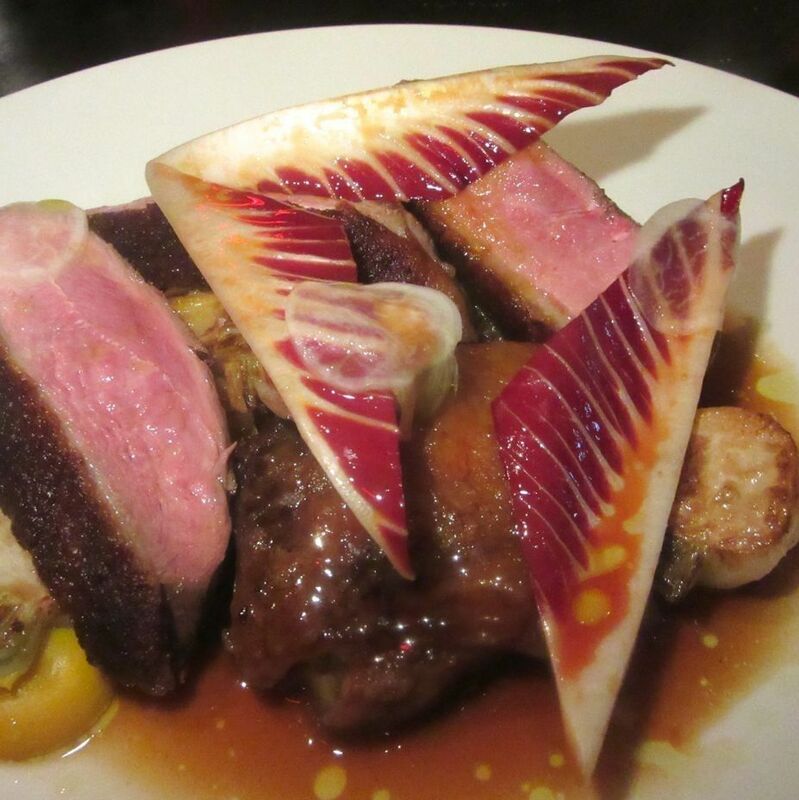 Many of the triumphs of The Vine’s menu will be reiterated in September when the place opens. The lounge and wine bar menu may be somewhat abbreviated, but “not much,” he thinks. The kitchen will serve both. The chef’s signature popover will seem redundant when New Yorkers get a taste of his garlic knots. 851 Sixth Avenue between 29th and 30th streets. 212 201 4065. Open for breakfast, 7 am till 11am, and for lunch and dinner from 11am to 1 am. Dinner orders will stop at midnight.